Many pool owners find that they need (or just want) to retile their in-ground swimming pools. While this can be a big job, most people can perform all the tasks needed if they follow some basic instructions. The following will give you an idea if you want to tackle this job or have retiling professionals do it for you. The pool needs to be drained completely. Once drained, remove any attached ladders, drain plates, or anything else that might become damaged while removing the old tiles. Remove the old tiles. Have some heavy-duty trash bags for collecting the old tiles. 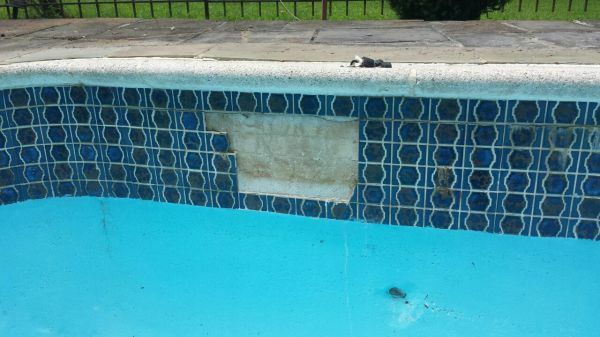 You can remove tile by hand using a hammer and chisel, or you can rent a pneumatic hammer (a good idea for larger pools). Once the tiles are removed, remove the old scratch coat. This is the old adhesive that was used on the pool walls to hold the tiles. It is very important that you do a good job of getting the old adhesive off the walls as this will make putting up the new tiles much easier. After you have the old adhesive removed, scrub the area to be re-tiled with a solution of water and muriatic acid—ten percent acid to water. Caution: when mixing the solution, use a plastic container and start by putting the water in first and then carefully add the acid. Wear eye protection when working with acid solutions! Use an acid-resistant brush to scrub down the area. When finished, rinse the entire area down with plenty of clean water. Allow the water to drain and the pool to dry. This next step is very important if you want a professional-looking result. Unless you are laying out some kind of free-flowing design, you will want to set a chalk line that you can run the first course of tiles off of. This line will keep your tiles nice and straight. If you are not sure how to do this, check online or visit your local hardware or tile store. Before you start this next step make sure you have EVERYTHING that you will need on hand. This would things like scratch mix, proper type of trowel, spacers (if needed), clean cloths, and step ladder (if needed). If needed, mix your scratch coat according to its instructions (some coats come pre-mixed). Do not mix too much at one time as it tends to dry out. Once you have your chalk line in place, apply some coating, using the proper trowel (usually a 1/8 inch grooved trowel). Apply enough to get your started, but don’t get too far ahead of yourself. Only apply where you plan to put tiles up immediately. Once you have some coating up, start setting your tiles, following the chalk line to keep things straight. Should any of the coating get onto your tiles, wipe it off with a damp cloth right away. Be careful not to use too much coating, especially in the space between tiles as this space will be grouted later. It can take up to two days (or longer is the weather is not with you) for the coating to dry. Do not attempt to grout until the coating has had time to set up properly. When the coating has set, mix your grout per the instructions. Again, do not mix too much at one time as this, too, will dry up on you. Apply the grout to the area between the tiles using the proper grout trowel. As you work, wipe off grout that gets onto tiles using a damp cloth or sponge. As a general rule, it takes a couple of days for grout to dry completely. Make sure it is dried before attaching ladders, drain plates, etc. Now, it is safe to fill the pool.